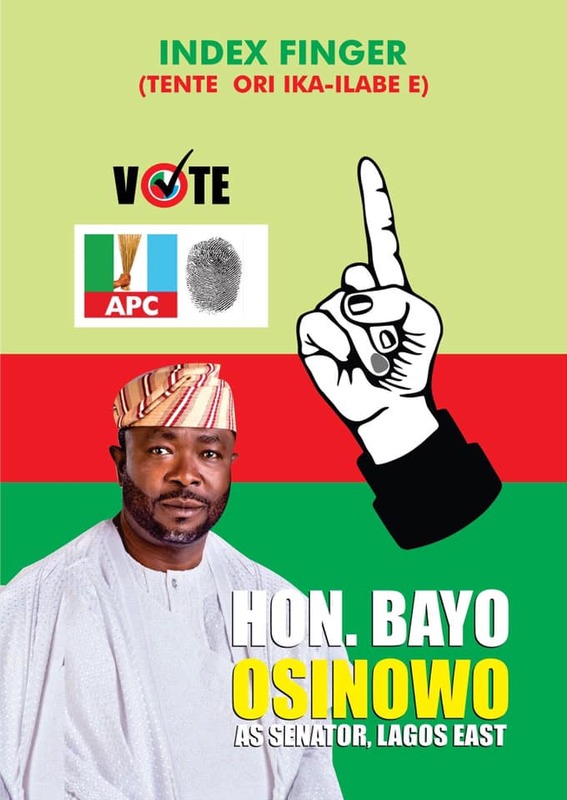 Home Featured Politics BAYO OSINOWO: The Only Feasible Candidate For The Lagos East Senatorial Election Tomorrow. 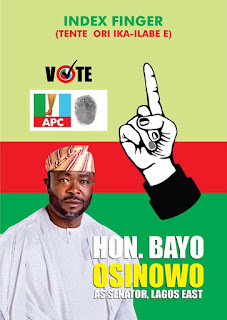 BAYO OSINOWO: The Only Feasible Candidate For The Lagos East Senatorial Election Tomorrow. Hon. Bayo Osinowo & Abiodun Oyefusi. 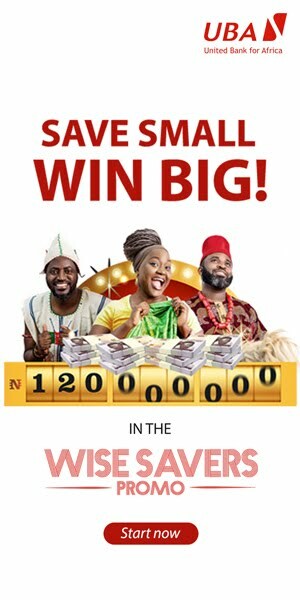 Just like yesterday, February 16th is here and it is the Presidential and National Assembly Elections, a platform for Nigerians to vote their president and those who will represent them at the two federal houses (Senate and the House of Representatives) of Assembly and the Lagos East is not left out of this bounty. All my life, I resonate more with women, intelligent women at that, who can hold their own and conquer and in the race for the heart of the Lagos East Senatorial district are two individuals, or would I say, two people who want to represent, and by represent I mean, clamoring for the votes of the residents in the zone. 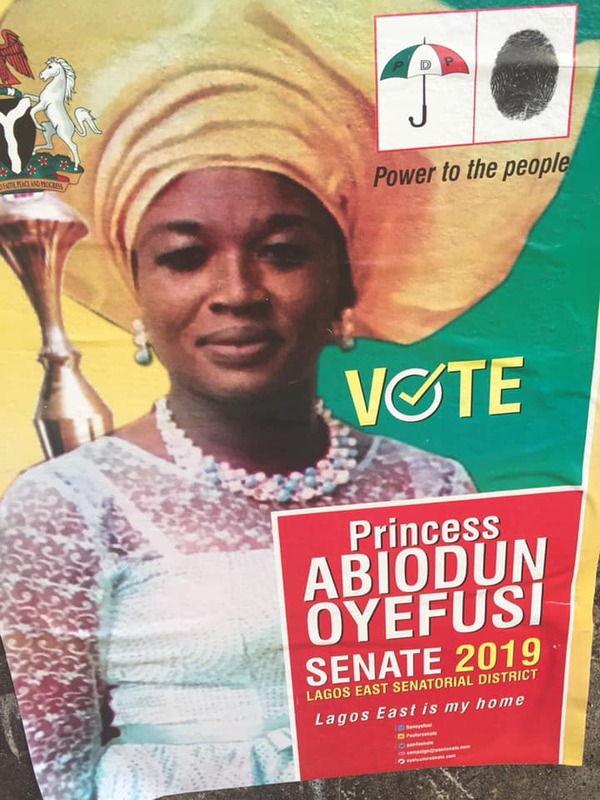 One is a woman by name, Princess Abiodun Oyefusi of the Peoples Democratic Party, PDP, who thinks she has what it takes to be the Senator, representing Lagos East Senatorial District, in the Senate and I will be fair enough to say that I live in the Senatorial District and I don’t know her. If there is anything I hate about women’s participation in Politics, it is when they feel that because of their gender, they should be treated differently. No, that’s not what a modern day woman should be known for. What I expect of women is for them to grab opportunities where they are available and make good use of them, not wait to be spoon-fed by others, including men who are also seeking to take part of the openings made available to the women. 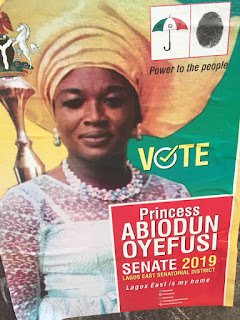 I have particularly sought after Princess Abiodun Oyefusi for the purpose of this story and have asked questions from people who live across the zone and it is very evident she hasn’t been engaging enough, if not at all. What I have found are a few of her posters, just like the one I have here, skeletally pasted around bus stops and junctions, which is not helping her, because most of the people who use these junctions and bus stops do not live in the zone. I can tell you authoritatively that the Princess has yet come to terms with what contesting for a position as gigantic as that of Senator portend and until she gets a grasp of what being a Senator is, she may never get it right in the politics of being a Senator, atleast, not in this present world. Then, there is another candidate, by name, Hon. Bayo Osinowo, current member of the Lagos State House of Assembly, representing Kosofe Constituency 1 and Chairman of the House Committee on Lands. Pepperito as he is fondly called is one man in the Lagos Political scene you cannot ignore no matter how hard one try’s and as it is said, TO WHOM MUCH IS GIVEN, MUCH IS EXPECTED FROM, so, Bayo Osinowo is the only one amongst the two who has traversed through the length of the Lagos East, canvassing and pleading with the people to vote for him. A RARE BREED HE IS. Hon. 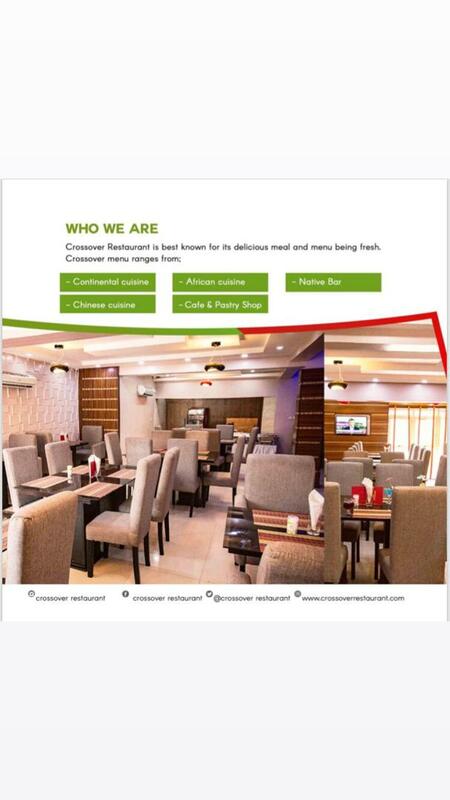 Osinowo has never taken anything for granted in his pursuit to be a Senator and this he has done by going to the people by himself. From Ibeju-Lekki, to Ikorodu, Kosofe, Shomolu and Epe, Bayo Osinowo has met with everyone needed to be met, spoken to the people whom he needs to speak with, had town-hall meetings like a new entrant in politics in his bid to give his constituents the opportunity to have a one on one with him, he has collated all the Information and data of what the problems of the people are, what the people want, the kind of representation expected of him and he is set to win tomorrow. In-case you don’t know, Bayo Osinowo is one of the most enigmatic politicians in Lagos today, highly cerebral, very experienced, humble, a thorough political breed, a solutions person, free handed, intelligent, builder of people, opportunities scavenger, a man of few words, but full of actions. I present to you, two candidates seeking to represent the Lagos East Senatorial District, one with no known pedigree and history, the other, with capacity, name, Pedigree, connections, experience and the wand to move the East of Lagos from where the occupant will leave it, to the Lagos of our dreams, the Mega City the Governorship candidate of the APC in Lagos, Babajide Sanwo-Olu is also inheriting. 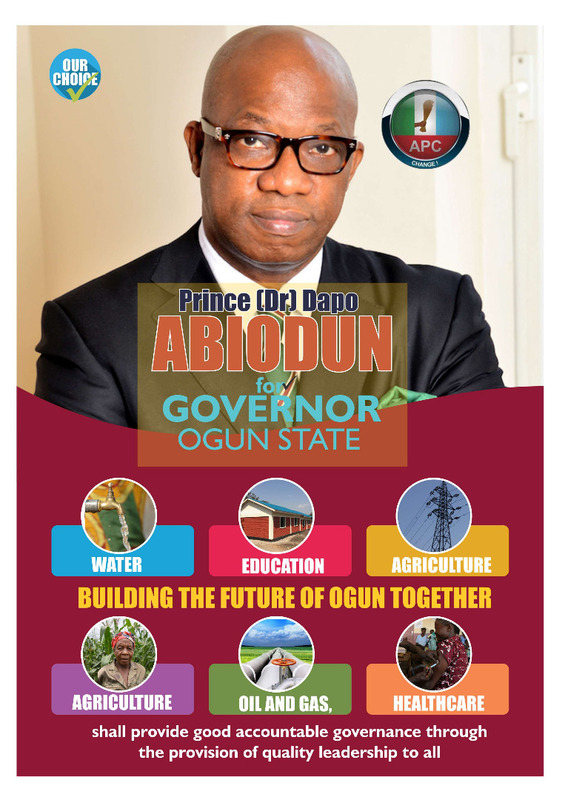 I present to you, my candidate for the Lagos East Senatorial District, Hon. 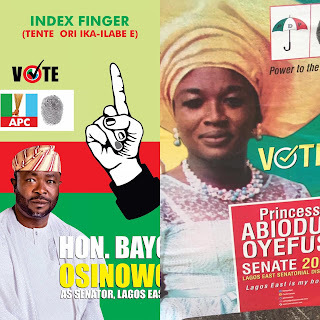 Adebayo Sikiru Osinowo, he is contesting on the platform of the All Progressives Congress, the APC.